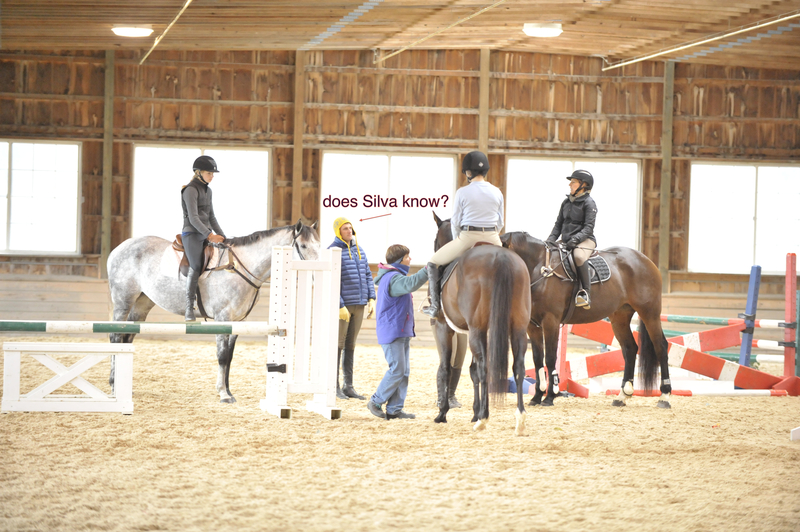 The love of my life, Onyx, my daughter’s 12 year old OTTB, had the honor of participating in a clinic with none other than Boyd Martin — yes, that Boyd Martin, the one who married Silva. Don’t ask how it happened, it just did. I had the dubious honor of doing the first day of the clinic. Mr. Martin has a unique ability to size up a horse and rider combination within seconds and determine exactly what they need to do to get better. To me, he said, “A green rider on a green horse.” Ooof! We all know how that works — an abomination at best. To my daughter, on the same horse, one day later, “Looks like you’ve done a bit of jumping.” One would think that by virtue of writing the checks (mostly good, some not so much) alone, I would garner some respect. Yeah, that’s not the way the horse world works. My burning question: Does Silva know you wear that hat? I think not. This entry was posted on November 24, 2014 by snoeberry. It was filed under Horses and was tagged with cross country.